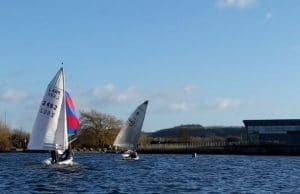 Sunday Racing kicked off with Dr and Mrs Smith’s setting two great course, in a way they did not follow the normal box courses round the cans we normally do, which was great a great change it had everything a good course needs, a Beat, Run and a few Reach’s. As we know a good course = good racings and with the breeze we had, that’s what we got. Great all round racing from front to back. A few went for a swim and a few went quick. Lets Keep pushing each other on the water! See you Next Sunday!